I'm really pleased how delightfully light the lacy trellis stitch on this scarf turned out. Finished with a nice scalloped edge, it has a cute detachable flower scarf ring. The scarf took me a couple of evenings to complete while watching Battlestar Galactica on our tivo. I used some of the left over winter warmth yarn from Lincraft and an 8mm hook, following the 'plain trellis' lace stitch which is basically made up of 5 chains, on page 94 of Crochet Basics by Jan Eaton. It's a handy book so I extended my library loan on it for an extra month. The light purple yarn turned out beautifully I think, and I made it nice and long, too. The edges are some scallops I added to make it a bit more 'pretty', putting 7 trebles (US dc) in each one, 4 in the corners, each edge has 2 rows of scallops to round it out nicely. I still felt the scarf needed 'more' so I searched for a new flower pattern. 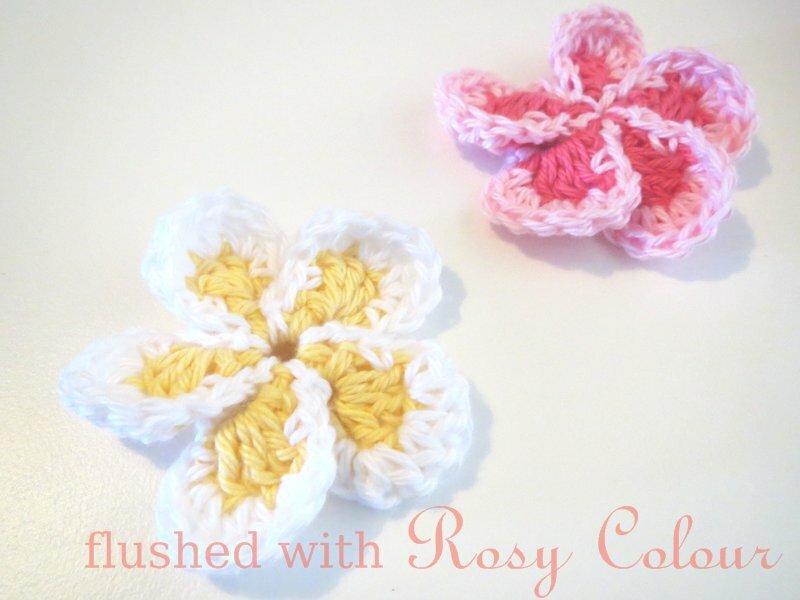 I wasn't happy that the ones I know would 'match', so I found this flower on youtube by Teresa. She does heaps of very well explained crochet tutorials on youtube and has helped me with several things so I do recommend her. This flower turned out real cute, using a 4.5mm hook to make the shape more defined than the loose stitch in the scarf. By making a chain on the back, the scarf can be threaded through and held firmly, so this flower can be used as a scarf ring which can be removed. I made this purple scarf with my mother-in-law Freya in mind, as I remember she likes purple and I still had this beautiful yarn in my stash. Although winter is over, it's still a little chilly, maybe she will get some use out of it before it gets really hot. I hope she likes it! I love the light and lacy scarf. Purples are my favorite colors also. I may try this one when I am done with some other projects. I will be coming back to your site.